It seems that once nationwide healthcare provision comes under the influence of the joint forces of profit making insurance companies, profit making private medical facilities, and profit-making drug companies, then the whole system starts to spiral up in costs, largely uncontrolled once freed from government budgetary constraints. We see how the costs of providing healthcare procedures in the US now, is so much more expensive than comparable procedures here in the UK or in other European countries. When us Brits try to make sense of what people do, and do not, pay for in the US, depending on whether or not they have adequate health insurance, the confusing complexity of the US system becomes all-too-apparent (note – linked article contains swearing). As a father of young children, I for one like to know that we have a health service which is free at the point of entry, and if one of my children was sick, I could get them straight into a hospital without having to worry about stopping to call my insurance company first. I won’t share links here, but I had a look at a few costs for non-NHS treatments in the UK. A grand to deliver a baby, two grand for a fibroid embolisation. £34 quid to have your LDL cholesterol checked, £110 quid to have your blood pressure monitored for one day. How about £4 grand for a coronary angioplasty (that’s having a stent fitted to open up a blocked artery, to help you not to have a heart attack) or £489 pounds for an epidural anaesthetic. You get the idea. Medical procedures don’t come cheap, and at the moment the private sector in the UK keeps prices as affordable as possible because they are still competing with the NHS. If there was no NHS, then it seems highly likely that quality of care would go to the highest bidder – the rich could afford the best, and what would that leave for those on the lowest pay? And let’s not even get started on the actual cost of medications. How can we ‘save the NHS’? So here’s the point of this blog post. The best way we, you and I, can help the NHS is to not get sick in the first place. The NHS is a fantastic organisation, but it suffers from one major problem. No, not a lack of funding, it has around £115bn to £120bn per year in funding, that seems like quite a lot of money to me. The problem the NHS has is too many customers. Rather than giving the NHS more money to build more hospitals and buy more drugs, let’s try making people healthier, then the ‘too many customers’ problem might start to go away. Rather than treating the end result of the NHS’s woes, let’s treat the root cause. The reality is that a staggering amount of ill health in the UK is actually self-inflicted. Oh, yes, ‘self-inflicted’ is not a phrase that’s going to win me many fans today! OK so ‘self-inflicted’ is a pretty aggressive statement, and I’ll grant that it should probably be modified to ‘unwittingly self-inflicted’, but the truth is that as a nation we are engaging in lifestyle and dietary behaviours that are driving much of our ill health and far too many people either don’t know they are doing it, they know but don’t know how to stop, or they know and just don’t care enough to change. Now to be clear, I didn’t say “all people” or “all ill health” is self-inflicted, so don’t start on me with that stuff. I am very aware that a percentage of all ill health is genetic, inherited, contagious or just plain bad luck. But the truth is that a considerable amount of all the heart disease, cancer, diabetes, stroke, autoimmune disease, fatigue and more in the UK every year could be avoided if people made healthier lifestyle and dietary choices. Some people are going to argue with me on this. I don’t care, this is not a popularity contest, it’s a call-to-arms for more personal responsibility. If we want to save our NHS, we have to start looking after ourselves, we have to live more of a preventive medicine lifestyle, so that we do not become the NHS’s customers of tomorrow. I earn a living going around the country speaking to people about health, weight loss, nutrition and more, and I find a lot of people out there live by the maxim “I’ll do what I like; eat, smoke and drink what I like, and when it all goes wrong, the NHS will fix me up! So they should, that’s what I pay my taxes for!” I am serious, people think this way and people say these things. Well my hedonistic tax-paying friends, if too many people think that way, those taxes need to go up, or there just won’t be an NHS for much longer. I give public seminars, and I often ask a room full of people “Who doesn’t want to get cancer?” and of course every hand in the room will go up. Then I ask “Who has ever Googled ‘how to live so you don’t get cancer?’ or something like that?” and usually no hands at all go up. It’s the same with heart disease, stroke and diabetes. Come on, admit it, you have never Googled “how to not get heart disease” and hardly anyone else has either. The only people who do or have Googled this stuff, is people who have ‘had a scare’ or been given the bad news already. The overwhelming majority of people just don’t spend any time actively looking these things up. The reality is, we don’t want these diseases, yet we live our lives with some kind of underlying assumption that we don’t have to do anything in particular to stop them from happening. We assume that if there are things we could do to stop them, the nice people in the government or at the NHS would tell us what to do. Well guess what…? THEY DO. We just ain’t listening. This is not some great unknown dark mystery, this is reality, and we know exactly what is causing much of this ill health. As the NHS so clearly explains to us “the Department of Health estimates two-thirds of them are entirely avoidable.” As I said, much of this ill health is unwittingly self-inflicted. Please, take a few minutes to read that last link. I’m not making this stuff up, it’s right there, the NHS are telling us what to do, but we’re ignoring the advice, and the system is going broke as the disease burden mounts. Personally, I believe these figures to be very conservative. – and you’ll find the same thing, over and over again, it’s all right there on publicly available pages on these websites. Personally, I believe that a full half of all the premature death and chronic ill health in the UK is caused by smoking, drinking alcohol, poor diet, obesity, lack of exercise, recreational drugs, binge drinking, exposure to industrial chemicals, irresponsible sun exposure, lack of sensible sun exposure, poor sleep habits and high stress. The more we look, it’s the same things come up every time. So we have to admit that many of our health problems are unwittingly self-inflicted. This isn’t about blame, but it’s about coming to an understanding that we must change, our society, at large, we must take control of this situation, otherwise things are only going to get worse. The government are not going to ‘save us’ or save the NHS. I’m just betting that most people reading this are aged between 25 and 65. If you want an NHS when you are 75 and older, you better start trying to help save it now. It seems a sure thing that if we do nothing, fail to change and all just keep going as we are now, in 10 or 15 years’ time, the NHS will be gone. I don’t know about you, but I’m 46 years old and I don’t like that one bit. I want to know that the NHS will still be there for me in 30 or 40 years’ time when I might need it. In 1963 only 1.5% of the UK adult population were obese. 50 years later in 2013, 28% of the UK adult population were obese. Childhood obesity was so low in 1963 it wasn’t recorded…but 2013, circa 10% of year 6 kids were obese, and a scary 20% of year 7 kids. Obesity, in 99% of cases, setting some mental health aside, is a self-inflicted condition – caused by many factors, not least our easy effortless access to masses of cheap low-nutrient food. We have more disposable income, more cheap food, more easy access to sugary calories, than ever before. It’s making us fat, it’s killing us and it’s bankrupting our NHS along the way. Most people are genuinely unaware how much control they actually have over their own health outcomes. Being overweight or obese is the 2nd leading preventable cause of cancer in the UK, responsible for 5% of UK cancer deaths. Poor diet is 3rd, drinking alcohol is 4th, responsible for 4% of UK cancer deaths, and lack of exercise is 5th, responsible for 2% of UK cancer deaths. And yet, when Cancer Research UK commissioned a research project, it found that 9 out of 10 Brits don’t realise that drinking alcohol causes cancer and in another study it found that 3 out of 4 Brits don’t realise that being overweight or obese causes cancer too. You see – much of our ill health really is unwittingly self-inflicted. It’s not to say we all must be rail thin, or no one should ever have a drink, but the truth is that most people do not realise that if you spend 20 or 30 years enjoying a glass of wine or a beer every evening, and being 20 or 30 pounds overweight, you are massively increasing your chances of becoming a cancer or heart disease statistic in your 50s or 60s. It takes government with balls and people with a sense of personal responsibility to take control of this situation and create change. When I interviewed an NHS GP about the state of health care in the UK last year, I asked if people are working hard to help themselves…and do GPs just prescribe expensive drugs too easily…I was told, and I was shocked, that 9 out of 10 patients just disregard lifestyle and dietary advice and ask “Doc, can’t I just have the pills?” This is the sad reality – the NHS is going bust because people are not taking personal responsibility. 9 out of 10 people. That is shocking and saddening to me. Mother Nature’s Diet offers a clear, simple, sustainable way to live that covers all the risk factors for all these major diseases. 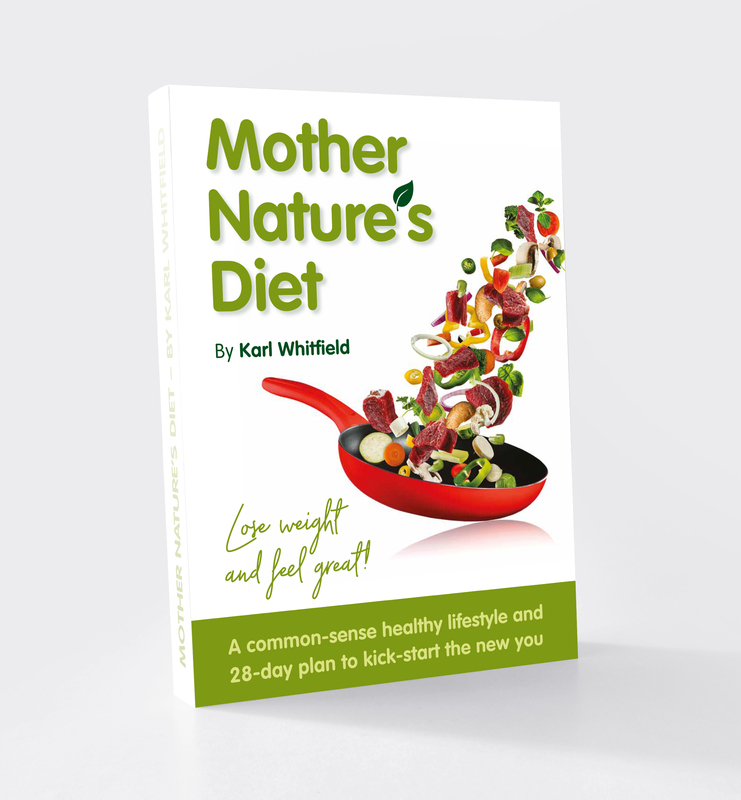 The 12 Core Principles of Mother Nature’s Diet have been designed for you to enjoy the best possible long-term health, in a way that is not a fad diet, involves no calorie counting and doesn’t require a lifetime of wasting money on expensive unproven supplements. Mother Nature’s Diet encourages you, indeed requires you, to take some personal responsibility for eating well every day, planning your life to ensure you have healthy nourishing fresh whole foods available at all times, and making time to enjoy daily, varied exercise. Having read this, the question you have to ask yourself is, what cost will we all pay if you don’t? ← Stop reading crap in The Daily Fail!